1. 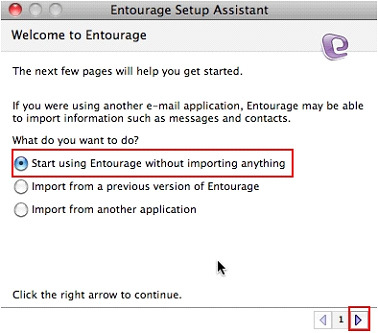 As soon as you open Entourage, the Entourage Setup Assistant appears. Select the option that makes the most sense for you. In most cases, if you are setting this account up for the first time, you will select Start using Entourage without importing anything. 2. 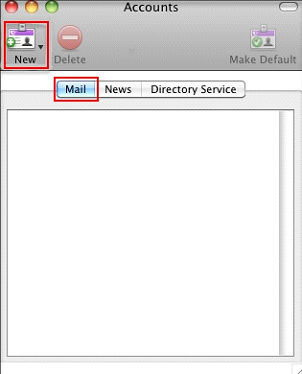 Decide whether you would like Entourage to be your default mail client and proceed to the next step. Click either No or Make Default. 3. 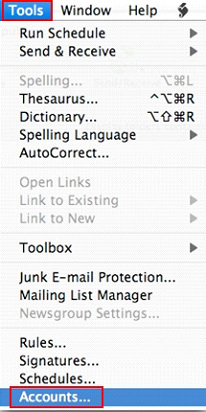 From the main menu bar, select Tools and Accounts. 4. On the Accounts pop-up window, select New from the Mail tab. 5. 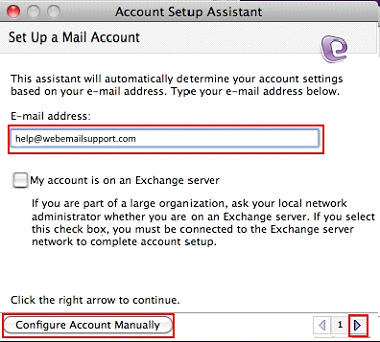 Enter the Email address of the account you are setting up, then click Configure Account Manually. 6. 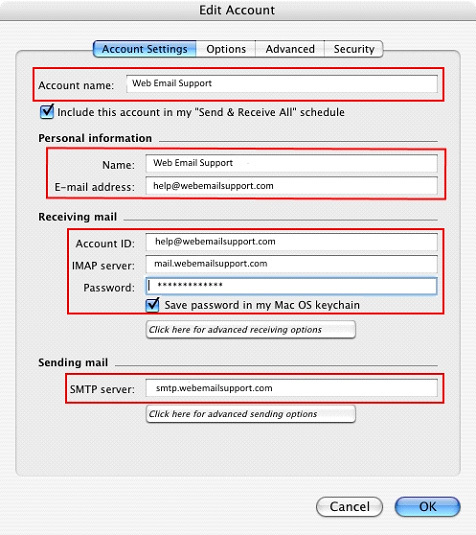 Select either POP3 or IMAP from the Account type drop-down and click OK.
7. Reference the following table to enter the necessary Account Settings and proceed to steps 8 and 9 before you click OK.
Account name Enter the name of the account. This information is used to reference the account within Entourage. Name Enter the name that will display in the From field when someone receives an email from you. 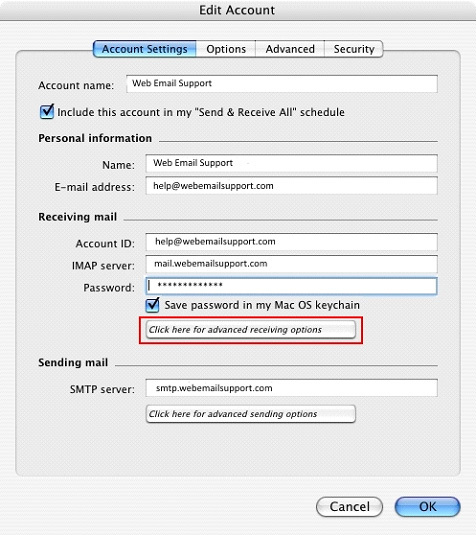 IMAP or POP3 server The full email address of the email box that you are currently setting up. 8. From the same settings panel, click the Click here for advanced receiving options button. 9. From the same settings panel click the Click here for advanced sending options button. Check the box for Override default SMTP port and enter 587. 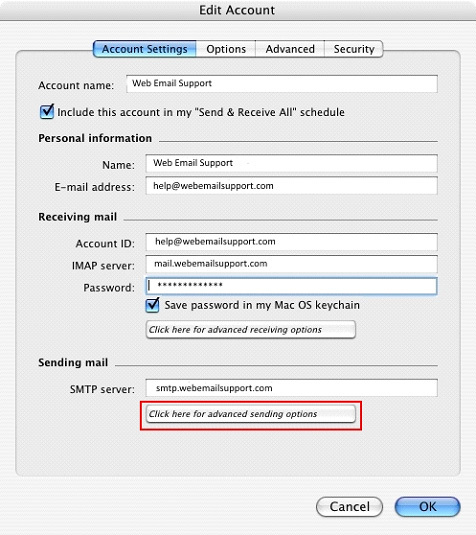 Check the box for SMTP server requires authentication and select Use same settings as receiving mail server. 10. Once you have completed Steps 8 and 9, click OK to complete your Entourage configuration.